When you opt for a modified shipping container for your industrial equipment shelter, you end up with more than a steel box. In fact, our climate controlled shipping containers offer numerous benefits over traditional industrial shelters – both permanent and modular structures. 1. Shipping Container Prefab Shelters are Cost Effective. Container shelters are less expensive than custom steel or fiberglass shelters because most of the structure is already in place. The modifications are still custom; they just begin in a recycled shell. 2. Shipping Containers are Modifiable to Suit Most Industrial Applications. Utility ports and bulkheads built to your specs. Plug and play plumbing and electrical. Waterproof flooring and walls with drains. Exterior polymer paint for water treatment settings. 3. Modified Conex Containers Have Durable Steel Construction. Falcon's prefab shelters are constructed of sturdy, 16-gauge, vertically corrugated, galvanized steel. If you need an industrial enclosure that can withstand the elements long-term, steel is tough to beat. Wood and fiberglass structures deteriorate considerably faster, and concrete is much less portable. 4. Containers Offer Optimal Protection from Environmental and Human threats. Not only is steel durable, it keeps threats at bay. From deadbolt and lever-locked doors to welded steel seams, shipping container industrial shelters and enclosures protect valuable equipment from extreme weather, pests, and potential break-ins. We can even weld the cargo doors shut for added security. 5. Shipping Containers are Easy to Set up and Transport. One of the key benefits of modified shipping containers for industrial applications is mobility. Falcon’s industrial shelters are easy to set up, move around a job site, or relocate cross-country. No cement slab is required for installation; just set the container on a flat, dry, and level spot. In addition, the standardized ISO sizing means you don't have to pay for for oversize load permits when transporting your shelter by truck. Once we receive your specifications and the modifications are complete, we ship the shelter to you. From there, your equipment or machinery can be installed under the experienced members of your team. Once installed, the container is easily relocated to your industrial site or another location. No need to haul in materials or hire labor to finish the build at the jobsite. Once the container arrives onsite, just connect to power and utilities, and you are good to go. In addition, our design and engineering team’s design plan ensures all equipment, fixtures and other contents are secure for transit and delivery. Whether the shelter moves 100 yards or 1,000 miles, you can be confident all contents will arrive in one piece. If you’re looking for a secure, long-lasting solution for your industrial storage or equipment shelter needs, repurposed shipping containers fit the bill. 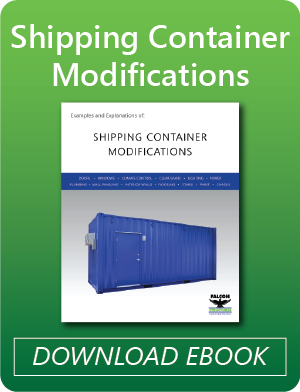 To learn more about container modification options for your industrial application, call 877-704-0177 to speak with a Falcon representative.